Before eating any meal you traditionally start with "Itadakimasu"
which literally translates to "I humbly accept"
The first up is Ramen. Typically a noodle based soup. It consists of Chinese-style wheat noodles and it comes with a variety of toppings. These toppings can range from from eggs, sliced pork, chicken, sliced ginger, nori, scallions and many more. 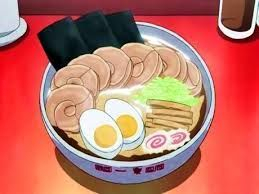 One of the most popular anime series that uses Ramen is Naruto and Naruto Shippudden, where the main character Naruto loves to dine at his favorite place called Ichiraku Ramen. 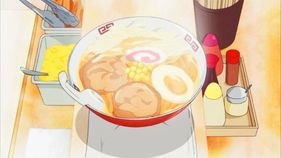 If you fancy a bowl of ramen, learn how to do it with easy steps on this page. Two characters (Ben-To) fight it out for the last Ginger Fried Pork Bento. 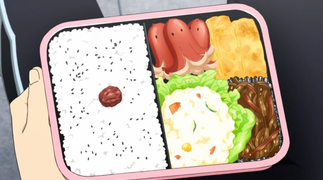 Bento Box Lunches can even come in a variety of combinations depending on the different seasons. 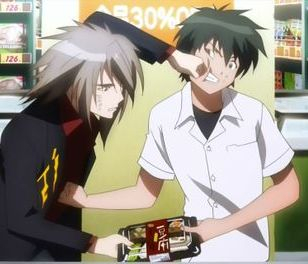 In one unique anime like Ben-To, characters race to beat one another in a supermarket to get well made Bento box lunches for an insanely discounted price. 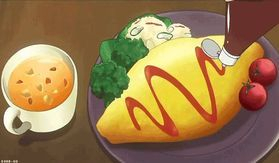 Another type of dish found within anime is Omelet rice literally consists of combination of an egg omelet and fried rice. The Egg Omelet usually consists of a just a plain egg fried on any flat cookware. The fried rice, on the other hand can be cooked in any way you desire. It can have vegetables, meat or mixture of both. After you have created both, you can then lay the omelet flat, place enough fried rice on about half of the omelet then fold the rest of the omelet. Then place ketchup on the top in any design you desire. 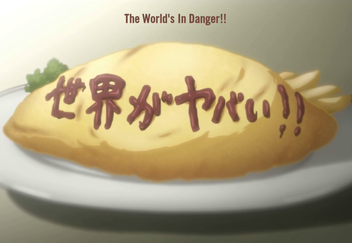 Some characters in anime often go out to a restaurant and eat Omurice, but one most ingenious way of using omurice is by placing a message to get the point across. Just like in that one episode of Steins Gate. If you want more in-depth steps check the visual aids link!! Another dish that is commonly seen and heard about is Japanese Curry. 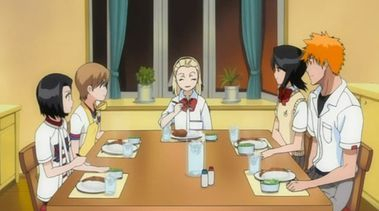 Curry was first introduced by the British (while India was still under their rule) and since then curry has been used in cuisine the majority of the time, especially in anime. Japanese Curry is naturally a little more sweeter than traditional curry and can be created using any type of leftovers. 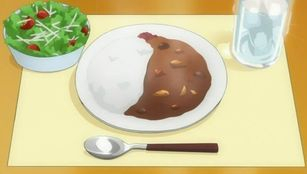 In anime, Japanese curry has been viewed in many different ways. 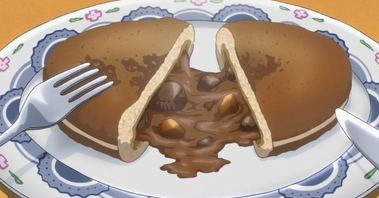 Within the anime Bleach characters eat curry with rice, while in Black Butler the main characters come across a competition using curry and then develops some Curry bread(buns). More details on how to make them here. 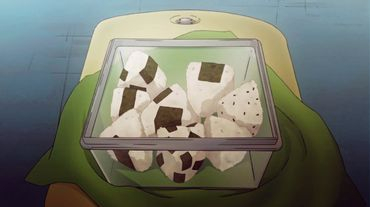 Another Japanese food item that is very common within anime is the rice-ball or also known as the onigiri. These onigiri consists of a outer white rice coating, a filling and a strip of dried seaweed. An onigiri can come in a variety of fillings. 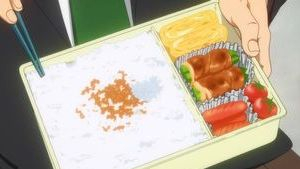 Some have chicken, mackerel, tuna, plain(salt), pickled vegetables, dried fish, etc... Then sometimes, if preferred sesame seeds can be added on the outside. Onigiri is famously known throughout all types of anime, it is literally a quick and easy snack to find among the majority of anime.